Today one of our largest e-book collections, ebrary, has been replaced by a new platform called Ebook Central. Ebook Central contains the same high-quality academic content that was available in ebrary, but you will notice some major changes to the search interface and the way in which search results are presented to you. You can access Ebook Central here, and will need your University of Aberdeen username and password to access it. The contents of Ebook Central are also searchable from Primo, our library catalogue. We still recommend, though, that the best way to search Ebook Central is to link directly to it and carry out your searches there. If you had previously been saving e-books to your bookshelf in ebrary you can transfer those books to the bookshelf in Ebook Central, but the transfer will not happen automatically. Further information on how to easily transfer your bookshelf is available in a separate blog post. 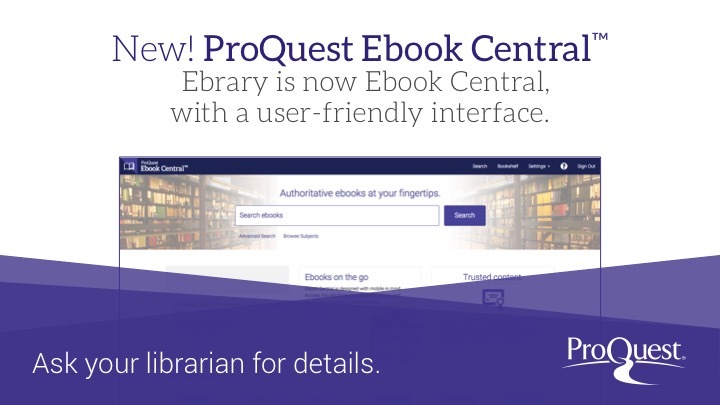 Library Guides on the new Ebook Central platform are available, and ProQuest also have their own online guide and some video tutorials.